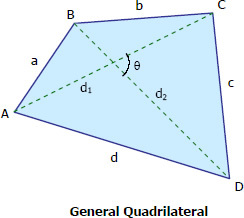 There are two broad classifications of quadrilaterals; simple and complex. The sides of simple quadrilaterals do not cross each other while two sides of complex quadrilaterals cross each other. Simple quadrilaterals are further classified into two: convex and concave. Convex if none of the sides pass through the quadrilateral when prolonged while concave if the prolongation of any one side will pass inside the quadrilateral. The following formulas are applicable only to convex quadrilaterals.